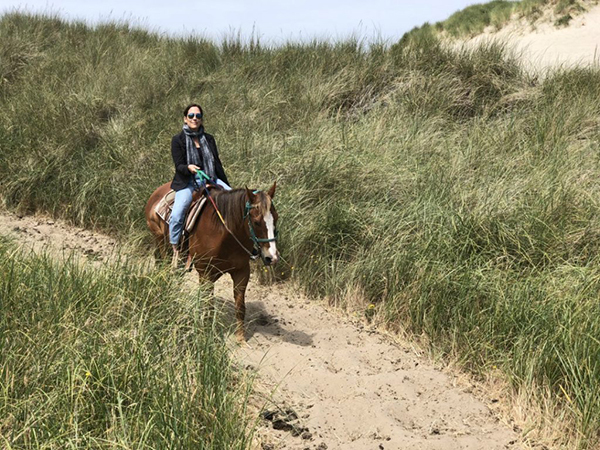 A horse-loving wanderer and author of The Modern Travelers takes a ride along the scenic Oregon coast with Green Acres Beach & Trail Rides. Photo courtesy The Modern Travelers. 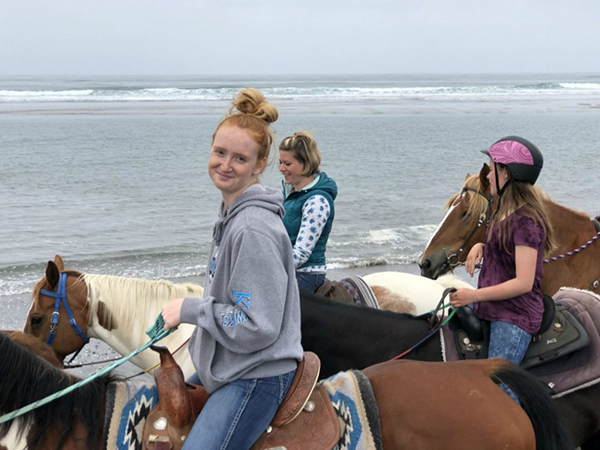 Horseback riding on the beach is a thrill. 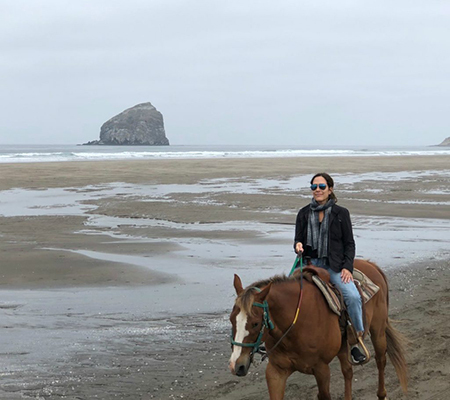 Horseback riding at all is a thrill to me, but there is just something magical about riding alongside the sea. 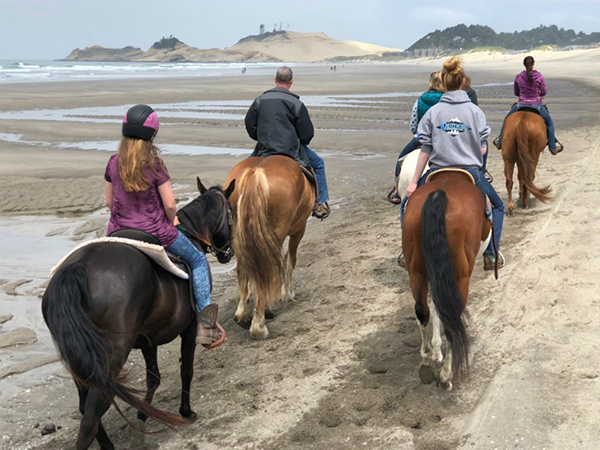 Green Acres Beach & Trail Rides is located on the beach in Pacific City. This particular beach is especially interesting for its haystack rocks, black sand, and an abundance of sand dollars--how beautiful is that? 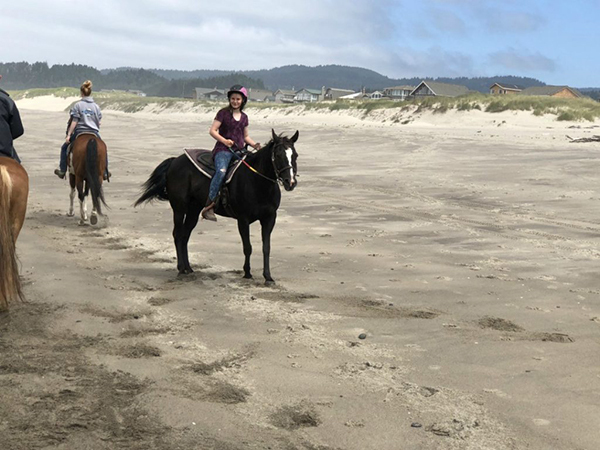 We were staying in Lincoln City, and it was less than a half hour to get to the beach front stable in Pacific City. 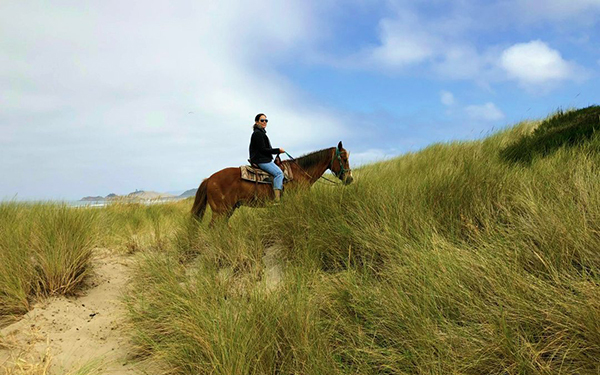 Green Acres is right by the famous sand dunes and Bob Straub State Park, within walking distance to the big dunes. You want to get there a half hour early so they can assess your riding abilities and choose the horse that is the best match for you. 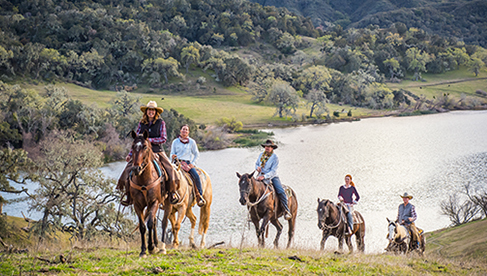 Each horse has a very distinct personality and the staff knows them extremely well. The owner I met, Terri, is just absolutely radiant with her love and devotion for these horses. You can feel the love a mile away. The guides and staff are fun to chat with and you really feel like you are amongst friends. It’s relaxed and comfortable. A lot of the staff are family members as young as Terri’s granddaughter. 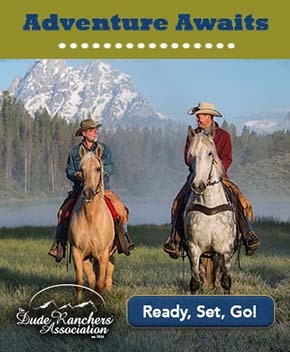 Oh, how I would have loved to have grown up spending my summers as a guide for horseback beach rides! She told me she never gets tired of it--she loves it. 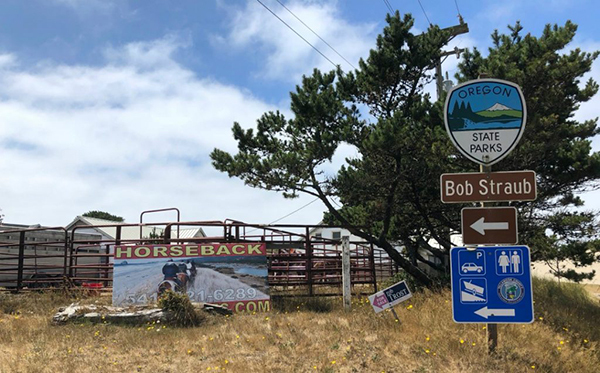 They take you along the beach, then through the dune grasses where there are pine trees and bright pink foxglove flowers in Bob Straub State Park. It’s nice to get a little of both terrains. The views the whole time you’re riding are fantastic. The trails are maintained by the local Elk gangs that frequent the area. Another wonderful thing about Green Acres is that these horses are all rescues. This is the second time I’ve gone riding with a stable comprised of rescues and I’m amazed at how friendly and loving rescues are. They are not timid or easily spooked like you would think. 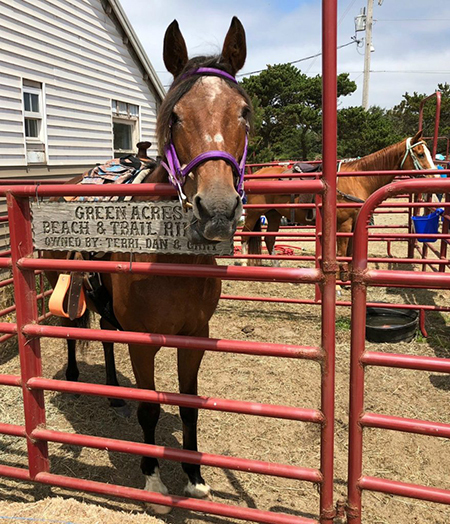 It can take some time to work with rescued horses to get to this point, but the people at Green Acres have done a wonderful job with this and their horses are happy and healthy. Look at this majestic creature. He’s a gentle giant and this was the first time I’ve ever seen people riding a Belgian draft horse, so that was a thrill. He is magnificent. 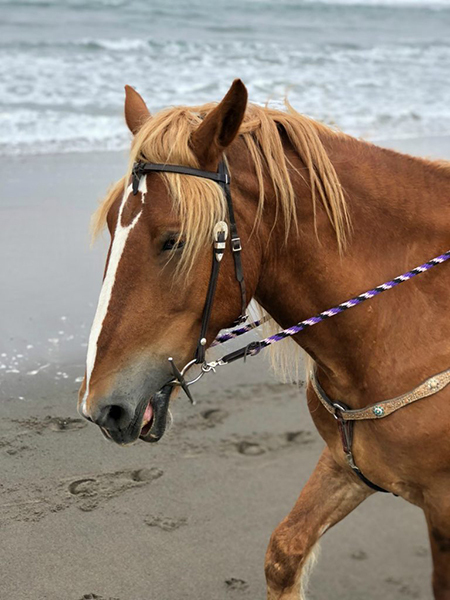 All the horses are friendly and responsive and interact with you when you walk up to them. There is even an ex-police horse among the herd. Wear closed toes shoes. I wore my Sanuks and they were fine (but it would have been more fun if I’d had my cowgirl boots with me!). Wear layers because it is chilly on the beach even in the summer. Just do it. This was the highlight of my Oregon Coast trip, it was a wonderful, soul-feeding experience, and as a bonus, you are supporting some good people doing good things in the world. I left feeling joyful and exhilarated and wanting to do it again. 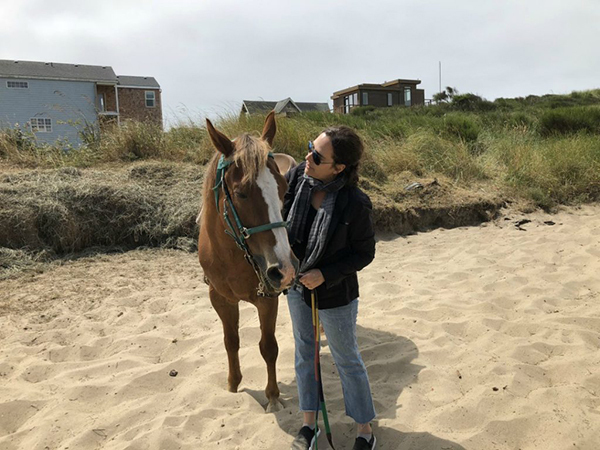 About the Author: Leah has been horse crazy since she was a kid and still loves to ride. She occasionally gets to indulge her favorite pastime as a freelance travel writer, and blogger on her website, The Modern Travelers. You can follow her on Twitter and Instagram.